Howard Barnes, Assistant Director of Cultural Services at the Council, informs me that outline schemes for the re-development of both the Sobell and Finsbury Centres propose the provision of four courts at each site (which would retain current provision at Finsbury but cut the number of courts at Sobell from the current six). The projects are in their very early stages of this project, and design briefs are yet to be worked-up. The current timetable for the design briefs is early 2009 with further public consultation timetabled during the first three months of the year. 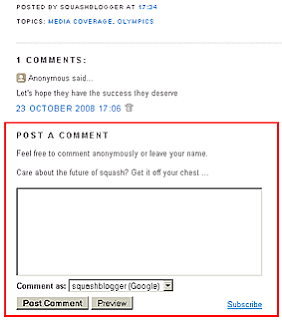 It's now even simpler for you to have your say about the future of squash at squashblog. Each article now has a free comment box under it (rather than taking you to another page), so you can respond immediately to whatever is written. Click on 'Read more ...' to see a full article and you will see the comment box beneath. You can comment anonymously, leave your name if you like, or log-in via a Google or other blogging accounts (each comment is post-moderated). 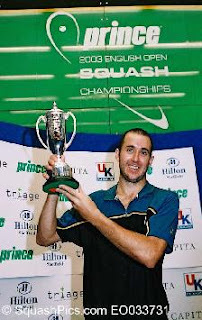 Have your say about the state and future of squash. 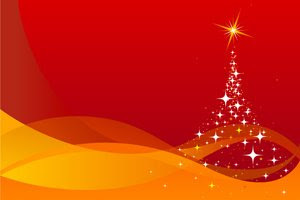 PS - Did you know that there is a squashblog Twitter community? The popular squash website Squashsite has closed. It remains to be seen whether the shutting down of the site brings the support from the governing bodies that they had been trying to negotiate before they chose to close. Squashsite had provided a comprehensive daily news service for squash around the world for a number of years, and its loss will leave squash fans with few online alteratives other than the governing body sites when looking for news on professional and amateur/recreational squash. Egyptian Ramy Ashour lost the first game to fellow countryman Karim Darwish, but came through to take the next three to become World Champion in Manchester today. Mistakes from Ashour gave Darwish an early 3-0 lead in the first. A couple of lets followed, which briefly halted Darwish's progress, and it struck me how few interruptions I had seen during their matches this week. There are far fewer lets than there used to be (how much of this due to the PAR scoring I am unsure), but it is far better for the game and the spectator to see the match uninterrupted. Darwish took some risks during the long rallies, with low, skiddy, cross-court drops stretching Ramy and mostly paying off. At 9-4 up, Darwish's confidence was evident as he pounced early on the ball (his speed was not something I'd noted in the past), and a tin from Ashour followed by a stroke gave Karim the game 11-5. The second started off rather scrappily with a number of strokes given away. Darwish was persisting with a percentage game interspersed with deceptive attacks, but Ramy was beginning to loosen up and attack more frequently. At 7-6 to Ashour there was a let called after he tried to run around Darwish who was in the process of hitting a drop in the front-court. This seemed hard on Karim (who - half-jokingly - protested that the shot was "the best (he'd) ever done"). A high cross-court backhand kill that nicked seemed to sap the remainder of Darwish's enthusiasm for the rest of the game, and Ashour opened his account 11-8. Ramy obviously had decided that he was in no mood to be constrained by Dawish's more patient game in the third, and began to hit more audacious shots. His impish pleading for a let at 3-1 amused the crowd, and it was evident that Ramy's character was to endear him as much as his style of play (is it just me or does Ashour look a bit like Pete Sampras when he delivers the innocent shrug?). Darwish was beginning to run out of attacking ideas, as Ashour second-guessed almost everything thrown at him. Ramy was by now chucking in attacking boasts from very deep that had Darwish wrong-footed, and his greater variety told in taking the game 11-4. At the start of what was to be in the final game, Darwish was visibly frustrated, staring down the barrel as he was. He stuck in the game to 4-4, before Ashour began to give an exhibition in how to turn defence into attack, turning seemingly lost causes into instant attacking positions. From this point Ramy ran away with it, and quickly raced to his first (or what are likely to be many) World Championship titles. After the winning point he fell to his knees, racket above his head (see photo above) before being congratulated by Darwish. In the post-match interview he spoke of the great spirit that exists amongst the Egyptian players, and that he "tried not to express emotion too much" as he was playing a friend and compatriot. His comment that is was "always important to keep a good spirit on court" will have gone down well with the IOC representative who was watching both finals - as will the absorbing display highest class sport, professionalism good behaviour that many have witnessed this week. Nicol David claimed her third World Championship with a 5/11, 11/1, 11/6, 11/9 victory over England's Vicky Botwright this afternoon. Botwright had particular success dropping on her backhand, often taking the ball high to force David to unsuccessfully counter-drop. Botwright seemed relaxed and composed, and stuck at her tactics to take the first 11-5. At the start of the second David started immediately to control longer rallies, volleying wherever possible to push Botwright to the back of the court. The increasing variety in her game seemed to affect Botwright's confidence when attacking, and the Malaysian took the second easily 11/1. The third game was tighter as both players started to rely on their ability to achieve a platform to attack from longer rallies up the side wall. Botwright was still working her backhand drops, but failed to impose herself at the T when she was given chances to put the ball away. 11-6 to David. The fourth was neck-and-neck all the way, both players retrieving well under pressure, both perhaps hesitant to force the issue. At 8-9 down, Botwright hit a superb, flat, backhand kill that brought it to 9-9, and the crown volume suddenly rose. A drop from David and a slightly lucky stroke (never the way you want a tournament to end) gave the champion her third title. Nicol was undoubtedly thrilled. She was a worthy champion this week, but in the two matches I saw (the semi against Madeleine Perry and the Final) she didn't look as infallible as her long run of success would have one believe. Once she has established her rhythm she is very difficult to break down, but there were glimpses in both games that this rhythm might be cracked if early pressure is sustained. I sense that the gap at the top of the WISPA rankings is narrowing given some of the upsets this week. Botwright departed the professional squash arena with a tearful farewell to the crowd, thanking those that had helped her sustain a career at the top of the game, including the 'England girls', England Squash, her parents and fiance. 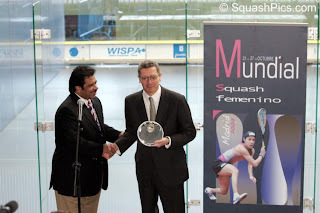 She now takes up a position as Head Coach at the Manchester squash centre. 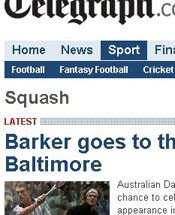 I had written earlier in the week that Botwright had under-achieved on the court at the National Squash Centre, and it is a shame that her career finished without her ever becoming National champion there. The script that had been written for the 'fairytale' ending that was not to be had a Henman-esque feel about it, which might equally apply to Botwright's career: a very respectable stretch at the top (she was ranked as high as five in December 2005), a firm crowd favourite and particularly successful when representing her country in team events. Henman - now also retired - polarises opinion between those who think that being one of the world's top tennis players for so long (and a great ambassador for the sport to boot) is a tremendous achievement in itself, and those who dismiss him as a very British kind of failure: lacking killer instinct, never won anything of note etc. It would be a shame if writers of Botwright's biog in the annuls are similarly split between those who followed her career and witnessed her dedication, highlighting her individual and team successes and (very late!) 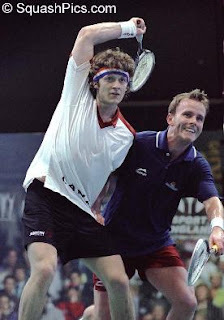 Indian summer in reaching the final of the Worlds, and those who will only remember her for a certain clothing-related incident that made the tabloids in 2001. 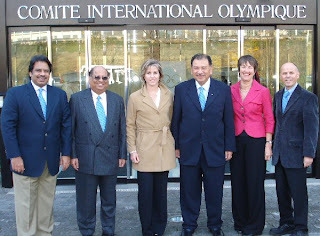 Most followers of squash will hope that she is remembered for the former, particularly because that one incident that some see as a blemish on a great professional career (including service to her country through the National squad) was a result of misguidance rather than lack of commitment on the squash court. Reigning Champion Amr Shabana took care of business in just 20 minutes in his quarter final against Mohamed El Shorbagy this afternoon. El Shorbagy had burst on to the scene earlier in the week with a shock win over Thierry Lincou, but his Egyptian team mate Shabana was not hanging around to become another scalp for the youngster, losing only 11 points in the match. Earlier in the day Nick Matthew managed to take a game from second seed Ramy Ashour (is he still the hottest prospect in men's squash?! ), who started the match slowly before gathering momentum. Vicky Botwright continued her amazing final attempt in the world's premier squash event with a four-game win over Alison Waters. She now faces Jenny Duncalf in the semis, which guarantees an English woman in the final for the first time since Cassie Jackman lost to Carol Owens in Hong Kong in 2003. Duncalf earlier beat Natalie Grinham for the first time in 13 attempts. 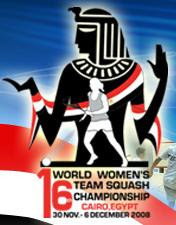 Click left to see highlights of days 3 and 4 of the World Squash Championships 2008, provided by Squash360.com. It was only Botwright's third win over the elder of the Grinham sisters, in what could have been her last match at a World Open. Botwright previously beat Grinham in the quarter final of the Cathay Pacific Hong Kong Open 2007, and she'll finish her professional career in singles squash with a 50% win record against the Aussie - a statistic that many of her top ten colleagues would envy against the World and British Open champion. The 31-year-old former world No5 recently announced her decision to retire at the World Championships after accepting the role as Head Coach at the prestigious National Squash Centre. She now faces England team mate Alison Waters in her quarter final. Mohamed El Shorbagy shocked Manchester yesterday with 12-10, 11-6, 7-11, 10-12, 13-11 (81m) victory over French sixth seed Thierry Lincou. Those who have been following El Shorbagy's rapid progress of the past year will perhaps not be surprised that he has claimed his biggest win to date at the Worlds, but even they would not have foreseen him beating former World Champion and world number one Lincou. The 17 year-old from Alexandria is coached at Millfield School by legend of the game Jonah Barrington. He now faces compatriate Hisham Ashour in the third round, before a potential quarter-final tie against top seed Amr Shabana. Elsewhere, other upsets - though perhaps less earth-shattering than El Shorbagy's win - included Samantha Teran, the 16th seed, crashing out to Annie Au, a 19-year-old qualifier from Hong Kong 11-5, 11-4, 3-11, 11-5. New Zealander Jaclyn Hawkes also defeated higher seeded former Champion Vanessa Atkinson, despite a fightback from the Dutch player, to win 11-9, 11-7, 8-11, 10-12, 11-5. 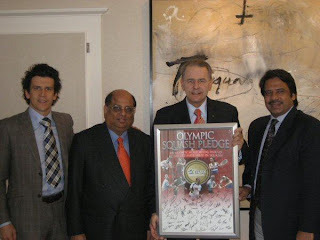 Click right to see a video preview of the World Squash Championships 2008, provided by Squash360.com. 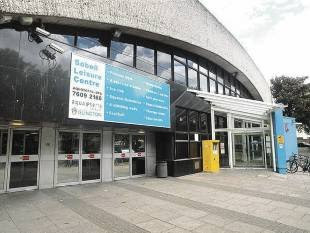 The Championships are this year held at the National Squash Centre, part of the Sportcity complex of buildings in Manchester, England. The complex was built for the 2002 Commonwealth Games held in the city. Like the music ... anyone know who it is? 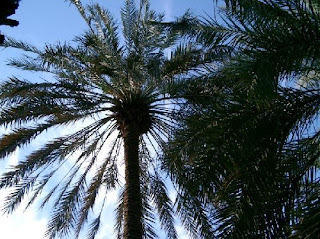 The past week has seen the highest number of unique visitors and the highest number of page impressions on the site to date, with readers from as far afield as Buenos Aires, Mölndal (Sweden), Kuwait, Oklahoma and the Dutch Antilles! Since its launch in January 2007, squashblog has sought to raise the profile of squash through dialogue with the squash community, the media and other agencies - so please comment on each article (you can do it anonymously!) and have your say about the future of the sport. We also recently launched the first squash community offering on Twitter, the "micro-blogging" site (you can also see updates from the squashblog Twitter page to the right of the squashblog main site). Demand for tickets to the Championships, which get underway this Saturday with the qualifying rounds (which are free to the public), have also resulted in all hospitality packages for the finals being sold out. Amr Shabana of Egypt and Nicol David of Malaysia will be favourites to retain their titles, but there will be no shortage of home grown players on show with 17 British players guaranteed to line up for the knock-out stages. Tickets are still available to see all the action up to and including the semi-finals, but fans are advised to purchase soon as numbers are becoming limited. There will also be a strong presence of players from the north west, including National Squash Centre coach and world number 12 Vicky Botwright, who will be retiring from the elite level after the Championships, and Cheshire’s Sarah Kippax (above), the official ambassador of the Hi-Tec World Squash Championships.